USS SCORPION … WHERE ARE YOU? As stated in part 1 the USS Scorpion had been attempting to contact SUBLANT without success, but did contact the Naval Communications Station Nea Makri, Greece (which forwarded the messages to SUBLANT). Sometime after 21 May 1968, SUBLANT supposedly sent messages to USS Scorpion that required the Scorpion to respond. SUBLANT received no response from the USS Scorpion. It is true that submarines at sea operate on a radio silence order. However, it is not unusual for submarines to be required to send radio messages (position reports, mission reports, and etc.). When the USS Scorpion was declared overdue a SUBMISS report was issued to all naval ships at sea in the Atlantic Ocean that required all United States submarines to surface and send a radio message with their position, to SUBLANT. This SUBMISS report would be used to account for all American submarines making sure no other submarines were missing, and as preparation for coordinating naval ships to conduct a search for the missing submarine. Submarines do not ignore orders to respond to radio messages. If a submarine is on a particular mission which requires their position to be covert, they will clear DATUM (withdraw to an area near commercial traffic lanes) and then respond as required. United States submarines never ignore a message from higher authority that requires them to send a message in response. The USS Scorpion was going into the shipyard at Norfolk after it returned from patrol. The torpedomen were disarming the torpedoes during the transit back to Norfolk, in preparation for offloading all weapons at the Norfolk Naval Base, before entering the Norfolk Naval Shipyard. As USS Scorpion neared the coast of the United States, she would have sent a message to SUBLANT with additional information concerning the work to be done on Scorpion while in the shipyard (any additional services or work not already scheduled, that the ship would require, as well as any additional services that would be required at the Norfolk Naval Base). Also, as the USS Scorpion approached Norfolk, Virginia on 27 May 1968, on the surface, the ship would have sent a message with their expected rendezvous time at the position where the Scorpion would meet the pilot boat, so they could pick up the harbor pilot for entering the Norfolk harbor. None of these expected messages from Scorpion were sent from the Scorpion. What this means in civilian language is, USS Scorpion was expected in Norfolk, Virginia at 1 PM local time on the 27th (5 PM Greenwich mean time) and did not arrive. At 3:15 PM local time on the 27th (7:15 PM Greenwich mean time) all submarines at sea were ordered to surface and send a position report to SUBLANT. All naval ships in port should get ready to go to sea in one hour. SUBLANT was taking the first step towards having all ships in the Atlantic Fleet scour the ocean for the USS Scorpion. On 30 October 1968, the USNS Mizar found the USS Scorpion 240 nautical miles southwest of the Azores in 9,000 feet of water. The controversies have grown ever since. According to author Ed Offley (in his book Scorpion Down), the navy started a secret search to find the sunken Scorpion days before it was expected at Norfolk. Stephen Johnson (in his book Silent Steel), says this is ludicrous because SUBLANT was not surprised that Scorpion ignored a message requiring Scorpion to reply. Unfortunately neither of these men are submariners or submarine veterans. If they were, they would know that Scorpion would not ignore a message that required them to send a radio response. They would also know that SUBLANT would not automatically assume Scorpion was sunk because it failed to respond to such a message. It would have been possible for SUBLANT to believe Scorpion was having problems with its radio (remember when Scorpion got to Rota, Spain all its radio equipment was down), or that Scorpion was disabled and on the surface. If SUBLANT believed either of those possibilities it would have been normal for SUBLANT to have ships in the area of Scorpion’s intended track (back to the United States) redirected to Scorpion’s track to look for Scorpion, as they passed through the area. However, this did not happen. Mr. Offley makes the case that a Soviet Echo II class submarine stalked and sank the USS Scorpion. If we are to follow this train of thought, then Scorpion picked up an Echo II class Soviet submarine trailing it. The Scorpion could not get away from the Echo II, and radioed into SUBLANT that it could not break trail. Then SUBLANT sent the Scorpion (with the Echo II following it) on a highly sensitive mission to spy on a Soviet task force near a SOSUS hydrophone array near the Canary Islands. Really. Not a very good way to conduct clandestine surveillance on a Cold War adversary. According to published characteristics of these two submarines, the Scorpion had a maximum speed of 33 knots and the Echo II had a maximum speed of 24.2 knots. To break trail the Scorpion would merely have to drive at its maximum speed for several hours because the Echo II class submarine would be unable to keep up. SUBLANT would not send a submarine that was being trailed to perform a covert surveillance mission. What SUBLANT would have done is to clear an underwater lane for Scorpion and ordered her to flank speed (33 knots) for several hours to break trail. Then Scorpion would be ordered to slow down and insure they had lost the Echo II before going on its new mission. Mr. Johnson also disagrees with Mr. Offley’s Scorpion/Echo II scenario. Mr. Johnson states that an Echo II (one of the Soviet Navy’s best submarines at the time) was too slow and noisy to engage Scorpion, and that the best Soviet underwater weapons were also ineffective against the Scorpion because all Scorpion had to do was to out run the weapon. Mr. Johnson is correct, but that does not mean the most capable always win. If this were true, a handful of Greeks could never have held off a Persian army that outnumbered them by more than 100:1. Also, what about France and Germany in 1940; France had the largest, best trained, and best-equipped army in the world in 1940. Germany, on paper, was no match for any European nation and certainly no match for France. Yet, the Germany Army overran France so swiftly that even the German Army was surprised at how fast they defeated the French military. The Soviet submarine commander would also know he was at a disadvantage, and would wait for an opportunity that gave him the best odds. Ask any submariner or submarine veteran and they will tell you that any adversary is treated as a real threat to their own ship, no matter the odds. So, how was it that SUBLANT supposedly knew the Scorpion was sunk in the mid Atlantic Ocean? Well, Mr. Offley states the Soviet Union sank the Scorpion as revenge for sinking one of their Golf class submarines. Then they told the United States government what they did and where the Scorpion was located. First, the US Navy did not sink a Golf class submarine. 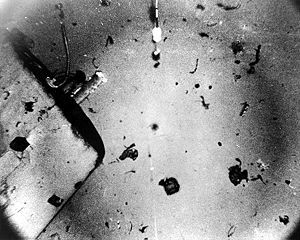 Second, if the Soviet Union wanted to sink an American submarine, they would not do that while the American submarine was in international waters, that would be an act of war. The Soviet Union would wait for an American submarine that was in Soviet Union territorial waters and sink that submarine. In this scenario, it would be the Americans that committed an act of war, and the Soviet Union would be only defending its own territorial waters. Mr. Johnson also, does not believe that the Soviets told America where the Scorpion was located. Mr. Johnson points out that when the above mentioned Golf class submarine was lost, the Soviets could not find it. So how could they find the Scorpion? What Mr. Johnson does not say is that the Soviets were looking more than 1,000 miles to the north of where the Golf class submarine had sunk. Simply put, the Soviets were looking where the Golf class submarine was supposed to be on patrol. However, the Golf class submarine was out of its patrol area. There are theories on the loss of this Golf class submarine, but officially we will never know why a Soviet submarine with nuclear ballistic missiles was more than 1,000 miles south of its patrol area and why it sank off the coast of Hawaii. I recommend reading both books. The USS Thresher and the USS Scorpion, both nuclear powered submarines, sank five years apart from each other. The USS Thresher was on sea trials after coming out of the shipyard the day before. The USS Scorpion was returning to its homeport after conducting classified operations. The formal inquiry into the loss of the Thresher was very thorough. The Thresher board clearly stated a conclusive determination of the reason for the loss was not possible. Then the board listed the possible causes for the loss and the probability for each possible cause. The board even went so far as to examine inquiry reports for other submarine accidents that could explain Thresher’s loss. The formal report on the flooding incident on the USS Barbel is included in the record of the investigation into the Thresher’s loss. The investigation into the loss of the Scorpion was not as all inclusive as the investigation into the Thresher. Also, large parts of the investigation and report into the loss of the Scorpion was immediately classified as secret. 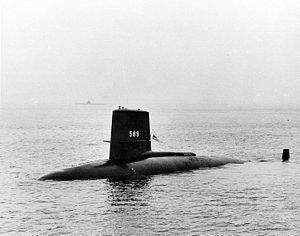 The declassification of parts of the investigation and the report has been very slow; even now 44 years after the accident (and 21 years after the last Skipjack class submarine, the USS Scamp, was decommissioned) many parts of the report and investigation remain classified. As best as can be determined, no other submarine accidents were looked at for possible explanations to the loss of the USS Scorpion. One person involved in the investigation, Dr. John Craven, started with the theory that one of Scorpion’s own weapons sank the Scorpion. Armed with a theory, Dr. Craven then examined the evidence looking for support for his theory. Not a very good way to do research. A TORPEDO SANK SCORPION: This is a popular theory, both one of Scorpion’s own weapons or the torpedo of another ship. There are SOSUS recordings of the loss of the Scorpion. 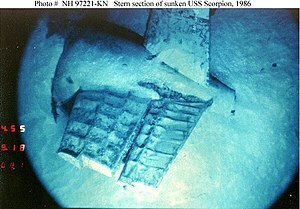 The navy also conducted experiments with explosives in the area where the Scorpion sank and compared those SOSUS recordings with the SOSUS recordings from the loss of the Scorpion. Explosive charges that most closely resemble the actually sounds of the Scorpion’s demise are less than one tenth the power of any charge carried on any torpedo the US or Soviet navies had. Also, when you compare the time interval between the first acoustic event and the last acoustic event; it matches the expected time interval between the implosion of the operations compartment at crush depth and the Scorpion hitting the ocean floor. FLOODING THROUGH THE TRASH DISPOSAL UNIT: One problem with this theory, but it is a big problem. Only one compartment imploded on the Scorpion, the operations compartment. An implosion is caused by the pressure difference between the pressure inside a compartment and the pressure outside the compartment, exceeding the strength of the hull. If the operations compartment was flooding, the pressure inside the operations compartment would be increasing as water flooded in and it would not implode. The torpedo room and the engine room did not implode, but the operations compartment did. Conclusion, there was flooding in the engine room and the torpedo room, but not the operations compartment. Therefore, there was no flooding through the trash disposal unit, which was in the operations compartment. 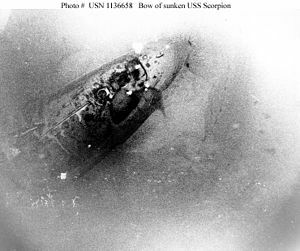 SCORPION WAS SUNK BY THE SOVIETS: Scorpion could not have been sunk by a Soviet torpedo or depth charge for the same reason it could not have been sunk by one of its own torpedoes. Also, the Scorpion could not have been sunk by a collision because there is no collision damage or external explosion damage on the Scorpion wreckage. THE SCORPION LOST ITS PROPELLER SHAFT AND FLOODED THROUGH THE OPENING: The newest theory. 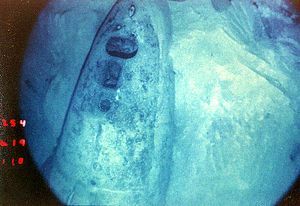 The entire propeller shaft of the Scorpion, with its propeller attached, is near the Scorpion’s engine room on the ocean floor. There have been submarines that have lost their propeller or propeller shaft. However, no submarine has ever lost the entire propeller shaft. The entire propeller shaft of the Scorpion was pushed out of the ship when the engine room telescoped into the auxiliary machinery space. All of the equipment cannot occupy the same space. As the engine room telescoped into the auxiliary machinery space, compacting equipment together from the two spaces, the propeller shaft was pushed out of the ship. The engine room did not implode, so we know there was flooding in the engine room. The flooding could have come through the shaft seals around the propeller shaft, but the propeller shaft was still very much in the ship until the engine room telescope into the auxiliary machinery space. If not, the ship would have taken on so much water, and sunk so fast, that the torpedo room would also have imploded. Which it did not. CONCLUSION: The Scorpion sank due to uncontrolled flooding. The flooding was either in the torpedo room or the engine room. The Scorpion had a leak through the propeller shaft seals which was repaired by the submarine tender. The captain of the Scorpion also wanted valves on the torpedo tubes replaced. It is possible that either of these caused the uncontrolled flooding. Then as the Scorpion descended into the depths, the other compartment began to flood through the already mentioned previous problem area. During the descent the submarine passed through the crush depth for the operations compartment, causing the total destruction of the operations compartment. There are a thousand ways the Scorpion could have sank, however there is only one way the Scorpion actually did sink. Change anything in the sequence of events of the Scorpion’s loss, and you change the debris field as we see it today. The wreckage of the Scorpion, in the ship and in the debris field, will tell us exactly what happened to the ship and in what order. We need to examine that evidence slowly, thoughtfully, and thoroughly. Several expeditions have gone to the USS Scorpion wreck site, collecting thousands of still photographs and hundreds of hours of film footage. Yet, the navy has released only a small fraction of this photographic evidence and maintains it has released all the photographic evidence it has. What the navy has released is less what was collected on just one expedition. The time has come for the navy to declassify everything it has on the loss of the USS Scorpion. The navy needs to release all the evidence, including photographic evidence it has in its possession. The time has come for us to recreate the events as they happened using all the evidence, so that these men may rest in peace and their families may find peace and closure.